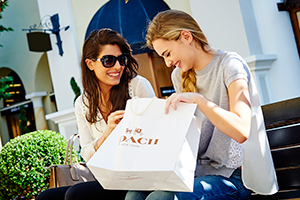 Enjoy a luxurious shopping experience with our shopping package, combining Gift Cards, luxury transport, lunch or dinner, savings and Hands-free Shopping. Shopping Express®: two return tickets on the luxury coach service from central Milan to the Village. 10% saving: VIP Card providing further savings on purchases in more than 120 luxury fashion and lifestyle boutiques. €20 Food&Beverage Voucher for two people: Valid in all of the restaurants of the Village. €50 Fidenza Village Gift Card: can be used in the boutiques of your choice in Fidenza Village. Complimentary Hands-free Shopping service: You do the shopping, we do the carrying. For €132 per couple, this exclusive Fidenza Village Shopping Package offers a unique, value added day out with up to 30% savings. A full day with return tickets on the Shopping Express®, the luxury coach service from central Milan to Fidenza Village, a €10 Food&Beverage voucher per person, a VIP Card and a €50 Fidenza Village Gift Card. Purchase your Fidenza Village Shopping Day package here online. Present the confirmation email you will receive at the Shopping Express® departure point. On arrival at Fidenza Village visit the Tourist Information Centre to receive your VIP Card, the Gift Card which takes 48 hours to process and therefore cannot be redeemed within that time and food voucher. Please note the gift card is only available for adult packages and takes 48 hours to process and therefore cannot be redeemed within that time. €10 Food&Beverage Voucher: Valid in all of the restaurants of the Village. For € 103 per person, this exclusive Fidenza Village Shopping Package offers a unique, value added day out with savings of up to 70% on the recommended retail price of national and international luxry fashion and lifestyle brands at Fidenza Village. Enjoy free return ticket on the Shopping Express®, the luxury coach service from central Milan to Fidenza Village, a Food & Beverage voucher, a VIP Card and a €50 prepaid Fidenza Village Gift Card. Purchase your Fidenza Village Shopping Day package here online. To redeem the package please present your confirmation email at the Shopping Express® departure point.Then on your arrival to Fidenza Village, visit the Tourist Information Centre to receive a VIP Card, the Gift Card which takes 48 hours to process and therefore cannot be redeemed within that time and voucher.